Back in 2008 All Day Entertainment announced that they were going to release a set of Charley Chase shorts, Becoming Charley Chase. Unfortunately market conditions tanked and with the slowing of DVD sales, particularly silent film, the project was shelved. At the time I thought the project would never see the light of day, but happily I was wrong. All Day, their previous releases include the exemplary Lost and Found: The Harry Langdon Collection and American Slapstick Volume 1 and Volume 2, has teamed up with VCI to finally release this collection of silent comedy shorts. 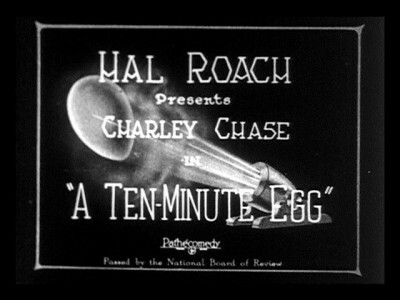 Covering over a decade in time, this set starts with Chase's early work at Keystone, progresses to his time at the Hal Roach Studio where he would blossom, and even contains a disc of comedies he directed. He started out working for Al Christie's studio in 1912 and by 1915 moved up to Mack Sennett's outfit. There he honed his skills, both in front of and behind the camera. In 1920 he made the jump to the Hal Roach Studios and a year later he was running the place. As Director-General at Roach, he oversaw all of the productions with the sole exception of Harold Lloyd's films. 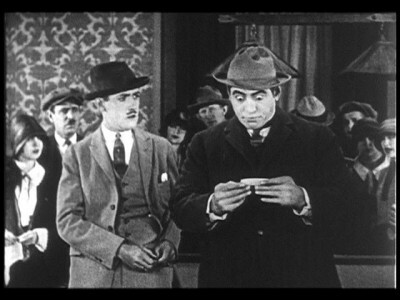 When Lloyd left Roach in 1923, another comic was needed on the lot and Parrott went in front of the camera once again. Directing himself for a time, Leo McCarey eventually took over the directing of his shorts and the two created some amazing and hilarious shorts before McCarey went on to cast a tall thin Roach actor (Stan Laurel) together with a large man who usually played the heavy (Oliver Hardy.) After McCarey's departure Chase took up directing himself once again. So, how are the Chase shorts? Overall they're well thought out funny pieces that deserve more attention than they get today. Chase (especially in the later comedies) played an average, middle class man. That's quite different from Chaplin's tramp or Lloyd's young go-getter. While those two comedians were trying to survive or climb to the top, Chase was just trying to get through the day, something that a lot of us can relate to. His comedy was much more grounded in reality than many of his contemporaries, and that's one of the reason's they've aged so well. 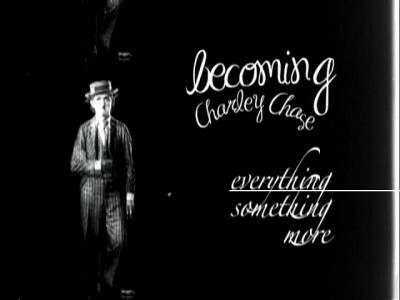 A lot of Chase's short play out like situational comedies more than the slapstick affairs that were common in the day (especially at Sennett's studio.) One particularly amusing short, an early one-reeler, has ending up with some business cards that identify him as the bouncer at the "Bucket of Blood Café". Needless to say, even the toughest hoods that see the card shrink away from the innocuous Chase. The genius to the short is that rather than reveling in mayhem, as many comedies did at the time, the humor derives from Chase's lack of violence. Having said that, these films are not all masterpieces. Sometimes Chase would take a potentially funny gag and not a lot would happen. In one short he goes to help a lady close the convertible top on her car, but instead of making it into a big production the way Keaton or Chaplin would have, he merely closes it. At other times the gags don't pay off as well as they should. There were a couple of shorts that left me cold (more the earlier ones) that didn't seem to be as tight and well knit as they should have been. These were very few however, but I kept on thinking back to them when wondering why Chase never made it to the big time. Even more damning than a couple of weaker short though, is the fact that Chase never made the transition to feature films. 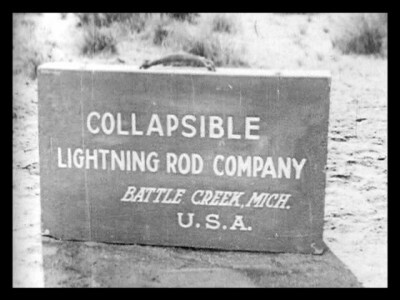 He made one long subject that was released by Universal, the talking film Modern Love (1929) but it did not do well and he returned to two reel films. That's sad, because as this collection attests, he was very talented comic. Okay, we need to talk about the video quality. These are unrestored prints of varying gauges, though if I'd have to guess I'd say most of them are from 16mm and I know at least one short comes from 9.5 mm film (the only surviving copy.) The prints are scratched, have poor contrast in general, lack the fine definition of 35mm film, and generally look below average even for silent movies. Here's the thing: This is the only place you can easily see these films. They are all watchable, but people used to restored classics like the Chaplin, Keaton, and Lloyd films will be disappointed. The problem is that it is just not economically feasible to restore these movies, especially the ones that need more work. If someone thought they could make a good profit by pouring money into top-notch restorations, it's obvious that they would do so, as countless other film restorations have shown. Given Charley Chase's low name recognition and the fact that these films are now in the public domain, it's doubtful that we'll ever seem many of these restored. Even if we do get a couple cleaned up will that be years or decades from now? So what are we left with? Two options: either don't see these at all, or watch the best available unrestored prints that can be found. Personally I'd rather have the option of viewing these, even with less than pristine prints, than not having the chance at all. I'll gladly take the scratches and spots on 16 mm prints over nothing at all. Here's where All Day and VCI separate themselves from the various public domain companies that will release anything they can get a print for: this set is packed with extras. Every short includes an audio commentary by one or more of the following film scholars: David Kalat, Ben Model, Ken Gordon, Yair Solan, Robert Arkus, Steve Massa, Bruce Lawton, and Richard M. Roberts. (I've undoubtedly forgot someone... sorry if I have.) These commentaries are entertaining and very informative, talking about not only Chase and his style but also the supporting actors, the crew, and other aspects of the shorts. One of my favorite commentaries is for a film on the second disc where David Kalat reads off the credits and then admits that viewers could have figured that information out for themselves. Having sat through WAY too many commentary tracks where the star or director does nothing more than describe what's on the screen, I found Mr. Kalat's soft jab at that type of commentary hilarious. In addition there is an overview of Chase's career, both in front of and behind the camera, The Parrot Chase. This 45-minute featurette is filled with interviews with Parrot/Chase scholars and clips from his movies. Though the interviews look like they were recorded a while ago with consumer grade equipment the content is quite interesting. A nice overview of the man and his times. Finally there is also a 15-minute interview with Charley's daughter, June Chase, conducted in 1997. She reminisces about her father, her 'Uncle Jimmy', their summer vacations, etc. The talk is illustrated with stills of Charley and is well worth checking out. All Day and VCI have released another wonderful set of silent films. The bottom line is that these are funny, and well worth watching. Even if you've never heard of Charley Chase before, you should check these out. They run from amusing to hilarious and will provide hours of laughs. I do wish that these films looked better, but there is little economic incentive to restore these rather obscure silent films, even if they are classics. A very strong recommendation.